It`s been months that we all are waiting to hear more about the upcoming iPhone7 and it`s features. It is said that iPhone7 will not have headphone jack. But for more features we all have to wait till next year 2017. Do you like the current Apple iPhone 6S Plus and iPhone 6S? if yes than we have a good news for you that iPhone7 will not look much different than iPhone6. Journal says that the only thing we get this year is a pair of phones but not hardware change but no more headphone jack also. It is said by journal that lightening port which is available right now only for charging and data will also be used to connect headphones in iPhone7. As iPhone is going to remove headphone jack that means they will make iPhone more thinner and improve its water resistance. 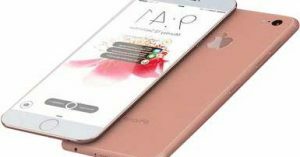 Now you may think that Apple iPhone7 may have some problem as there will not be any hardware changes. But to tell you there are rumors that iPhone will keep headphone jack and also introduce second sim card slot. Till now Apple has not made any official comment about these rumors, or may be they want to keep the rumors floating in the iPhone market to grab more attention and create more anxiety about their upcoming iPhone model iPhone7, But in reality no one is going to announce anything and I believe we have to wait for few more months to get the real story of iPhone7. Are you also waiting with me for iPhone7? What do you think about these rumors? If you have any question or suggestion, feel free to ask me via comments. If you have any question, feel free to ask me. If this post was helpful then please keep on sharing it and Do not forget to like us on Facebook and follow us on twitter.